Assistant Coach Dwayne Peel and Director of Rugby Les Kiss ahead of the game. 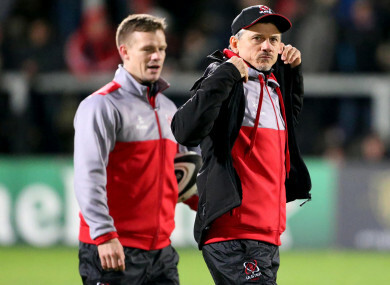 A CALM HALF-time team talk was what changed Ulster’s fortunes in their remarkable come-from-behind 24-17 win over Munster at Kingspan Stadium, according to Director of Rugby, Les Kiss. Admittedly helped by Sam Arnold’s second-half red card for a dangerous hit on Christian Leali’ifano, the hosts had to claw back a 17-0 deficit at the break to somehow emerge with a bonus point from the fiery encounter. Having seen his side concede two maul tries to Niall Scannell and a further penalty try at the scrum in a one-sided affair before the interval, Ulster emerged a new side in the second 40 and turned the game around. Tries from Craig Gilroy (two), Darren Cave and Rob Lyttle helped them on their way to victory, and Kiss revealed that there was no crisis at the turn, rather a composed reflection. “At half time we knew we had to do something with the set piece and so the two changes certainly helped. The two lads that started the game, that’s their first game in a while and it probably told,” Kiss said, referring to the decision to swap out struggling props Kyle McCall and Rodney Ah You. “But half time the message was pretty simple, we had to look after the ball at the breakdown and not let them have easy access to it. We make two clean linebreaks and throw the ball away easily and we lose three attacking set pieces in good positions. “We had to get in front of the simple things in the game, and we knew if we did that we had opportunities across the pitch, and we could make some hay. Counterpart Johann van Graan admitted the decision by referee Sean Gallagher to red card former Ulsterman Arnold for his head-high hit on Leali’ifano was right, and Kiss admitted much the same. “You don’t like to see anyone go off in the game for those sorts of things, but (the ref) had no option, I thought it was quite clear,” the Aussie coach claimed. Indeed, playing for most of the second half with an extra man, and for a while with two due to sub Fineen Wycherley’s sin binning, was what brought Ulster back into the game as they reduced the deficit to just a score. Cave crossed for his score with Wycherley off, and Gilroy added the first of his brace while both players were off the pitch as the hosts took full advantage of their extra personnel. As Ulster have proven already this season, playing with an extra man can sometimes be difficult, but this time, as Munster tired, the hosts kept up their momentum which eventually led to Lyttle racing over for that crucial fourth try with the final play of the game. “I think the beauty of that period was we stayed direct, we stayed to the plan and didn’t try to invent any fancy stuff, because we did the little things we committed to at half time in better fashion,” Kiss reflected. Possibly most importantly, that second-half performance answered a lot of questions that fans have had about Ulster, questions that would have persisted into the awful first half. After the drubbing at Connacht a week previous it was widely accepted the northern province needed to produce a big performance, not just the result, and in the second half they certainly did. “The most important thing is we didn’t sweep (the Connacht game) under the carpet,” revealed Kiss. “We all hurt, and we made a commitment as a group to be a part of the problem on that day but also part of the solution. “We worked hard this week, the first half was disappointing but I was really pleased by the boys’ calm at half time to step into that second half and do what we had to do. “Does it make amends? I don’t know. It still hits you hard when you think about it. You just have to respond. Email “'It was a very calm half time, it wasn’t mysterious what was happening'”. Feedback on “'It was a very calm half time, it wasn’t mysterious what was happening'”.